A group of third graders were working with writing in response to multiple texts. They had successfully mastered dissecting a prompt, taking notes and writing the big ideas and details in their essays. However, their teacher had noticed they were struggling in writing a proficient topic sentence. She wanted them to include the titles of the texts they read in their initial sentences. The teacher came to me, asking if I had any suggestions of a way to help students remember to include the necessary components of a good topic sentence. I began to experiment with possible acronyms students could use to help them remember to include text titles in their topic sentences, as well as the topic found in the prompt. 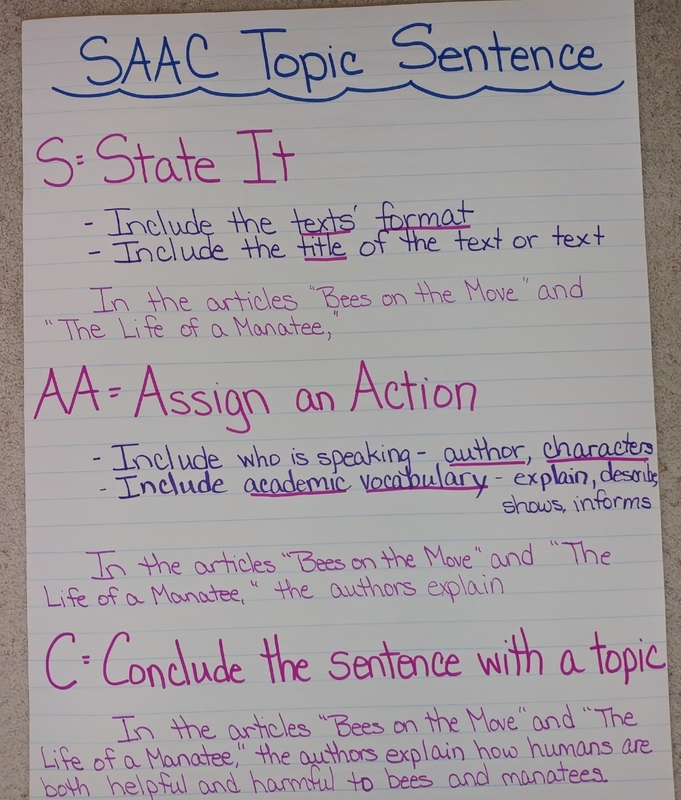 We had previously learned an acronym, SAAC, for the topic sentence used while writing summaries. I wondered if it would also work as a topic sentence for informational text. To determine if this format for a topic sentence would work for responding to text, I selected a previous prompt we had used to teach notetaking. Read the articles “Bees on the Move” and “The Life of the Manatee.” As you read, think about how humans impact their surrounding environment. Write an essay explaining how humans can be both harmful and helpful to the bees and manatees. Include evidence from the text to support your response. The students easily dissected the prompt, locating the format (essay), the topic (humans can be harmful and helpful) and the big ideas (bees and manatees.) We discussed that the plan could be set up in two ways. It was time to explain the acronym SAAC to students and determine if it would be helpful to them. We created an anchor chart outlining the process for writing a SAAC Topic Sentence. There are two parts for the State It component. 1) Include the type/format of the reading selections. Is the text an article, poem, passage, or story? The first A stands for who is doing the action. In this case it was the authors of the texts. The second A stands for what that identified person is doing. In this example, the authors were explaining. This is a perfect time to encourage students to use academic vocabulary in their writing. For example: explains, describes, tells, shows, informs. What do I write my essay about? What is the topic of the essay? In the articles “Bees on the Move” and “The Life of a Manatee,” the authors explain how humans are both helpful and harmful to animals. After creating our classroom anchor chart, it was time to practice. Providing the students with a second prompt, we practiced only writing a topic sentence. The students loved the idea that they didn’t need to write an entire essay and eagerly began to write their topic sentences. Students were accessing the chart and following the steps sequentially. The next day we provided students with a third prompt to provide additional practice. We were thrilled to watch the students write topic sentences that were clear, focused and included all the necessary information. The SAAC topic sentence model had provided students with another tool which helped them successfully write to multiple texts. Older PostDoes Any Topic Sentence Work?